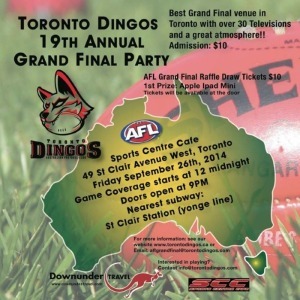 The Toronto Dingos Football Club will host its 19th annual AFL Grand Final party (19 years! Crazy!) on Friday Sept. 26 at the club’s sponsor pub Sports Center Café on St.Clair close to Yonge Street. The game day coverage will commence at midnight and doors will open at 9 P.M.
Before the match, there will be heaps of prizes up for grabs and competitions to be part of such as first goal, best on ground and door prizes. We also have our major raffle draw ($10 a pop!) where the first prize is an Apple iPad Mini. Tickets will be sold at the door on the night. The Sports Café is a terrific venue for such sporting events. It hosts Superbowl parties and Olympic hockey final games with more than 30 televisions in the pub so everyone gets a great seat. 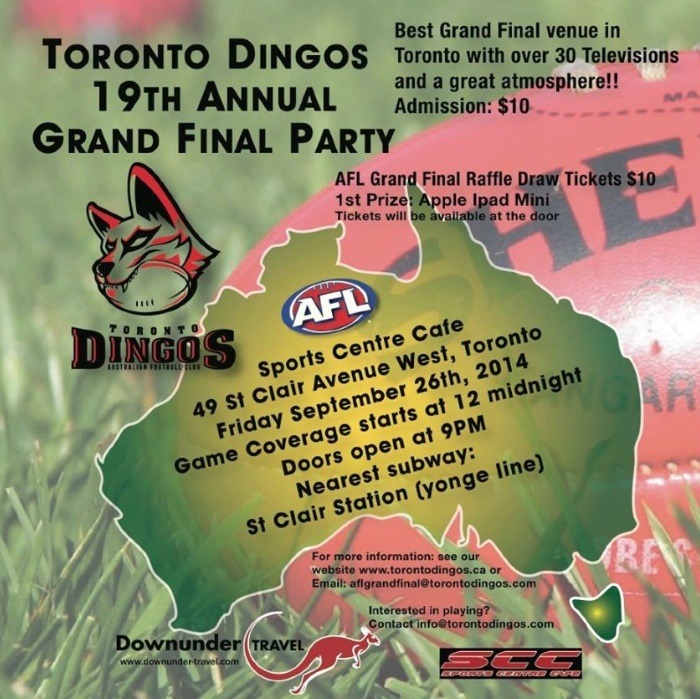 Traditionally we get 300-400 spectators on the night and is the biggest AFL Grand Final party in Toronto. No other venue gets the numbers we get for an AFL Grand Final. So come down and enjoy the fun! Entry is $10 and the Sports Café is close to St.Clair Subway Station on the Yonge Line. Players of the Toronto Dingos Football Club will be at the door and running the football competitions and raffles on the night, so if you’re interested in having a kick in 2015, please ask one of them for more details!